Here in PA, we have yet more evidence that those who claim to be “pro-life” are concerned with nothing more than control of anyone who disagrees with them. There was a bill that would require that employers offer their pregnant employees a seat or allowing them to have a beverage at their work station. We have 55 legislators who have supported a bill that would significantly restrict abortion access. You know how many of the same people voted for this aid for women? Three. Yep, so much for thinking of the women and children. It’s only “think of how much we can force them to obey something that we claim is true.” Lovely to see such a perfect example of hypocrisy. On other matters, prayer as a subject has been on my mind because of the ebola outbreak in western Africa and its constituent countries. A missionary and a doctor got a rare experimental serum created by the scientific method and appear likely to survive the ravages of the disease. This serum was allowed to be used because of a US exception to the law that if something might help, the drug or treatment can be used without the usual safeguards. This also means that this serum may never be available if it doesn’t meet the usual standards of safety and effectiveness *OR* if it doesn’t meet the profitability for its producer. A lot of people will again be left with nothing or with prayer as their only options. 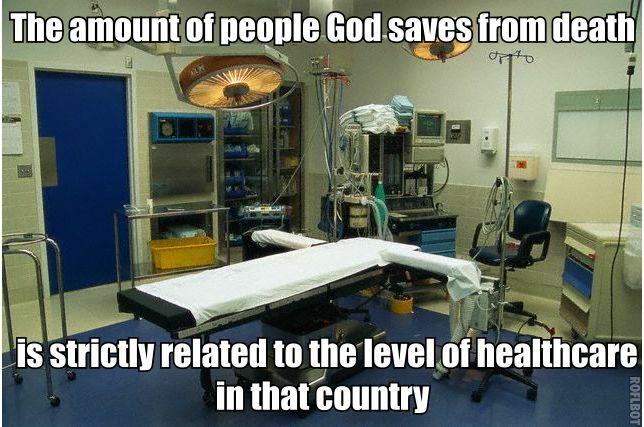 And we know that prayer is utterly ineffective for actual aiding the sick and dying. At best, it may make people believe that they feel better, but they still die with the same rates as anyone else. It also makes people feel like they did something when they did nothing but whistle in the wind. This is underlined in the latest couple of columns from Billy Graham and Rabbi Gellman of the God Squad. In Billy’s column, the querent says that people get better or not depending on how they respond to treatment, prayer does nothing. Of course, Billy insists that prayer is important because people “almost always turn to prayer” if they or their loved ones have a “serious health crisis.” In case you don’t recognize this, it’s the claim that there are no atheists in foxholes so, surprise, there has to be a god! (there are plenty of atheists in foxholes) Billy then goes on to say that heck, even if there is no god, we should pray for them anyway, it can’t hurt can it? He also assumes that the querent isn’t sure if this god exists, and then goes into making the usual baseless claims that this god does, that its avatar Jesus exists and that we should believe no matter what,, making the usual Pascal’s wager argument. Yep, the bible says that JC says that he is the way and the truth and the life, but we may as well believe that Lord Krishna is the same thing, with the same amount of evidence. Rabbi Gellman’s column (beware site has annoying popups) has the querent, a Catholic, asking if the prayers that they say daily at mass do any good. They admit that the prayers make *them* feel good, because they imagine that they are doing something. The querent wants to know if this god gives the patient “peace and acceptance”. The rabbi addresses this as the difference between why some people believe and some people don’t. Theists believe in things that have no evidence. Other theists don’t believe that other gods do anything. And non-theists don’t believe that something happens when there is no evidence of such a thing. The rabbi does admit that there has been no scientific evidence for prayer working. Good for him, for that is the truth. But the rabbi wants to keep pretending that something happens when there is nothing that shows it does. One may as well say that “hey, there is no evidence at all for aliens visiting earth. But heck, I want to believe in it anyway, no matter what reality says *and* I’ll keep telling nonsense to others so I feel better about myself.” Seems a bit delusional, no? The rabbi claims that his god really honest heals people, but that humans can never force this god to do anything because we ask for it. Indeed, he claims that “no religion of any stature” teach that prayer can change god’s will. This of course belies the teachings of the rabbi’s myths that prayers will be answered (see the nonsense of Exodus), that this god will do what is asked (see the testing of this god by Gideon), etc. Rabbi Gellman says that we cannot know the will of this god nor can we change this god’s will. Hmmm, seems that Lot did just this when bargaining with this god about Sodom. It comes down to claiming this god seems to favor folks who have access to first world medicine and basically tells those who haven’t the access that it isn’t its will that they live, not have a amputation, etc. This quote from the rabbi is just sad “God might have a desire to heal a person and then, in addition to the application of clinically-approved medical science, the person may be healed in a way that defies rational explanation.” Or you can just eliminate the need for a magical fairy and get the same result. The rabbi says that he “chooses” to attribute healing to his god rather than some unknown biological process. Yep, all theists do the *same* thing, that their god magically did something, with no evidence whatsoever. He also chooses to believe that some people aren’t desired by his god to be healed, as is convenient to any theist. It’s nice that he quotes Hamlet, but again we have no evidence of his god at all. We also have no evidence that this god gives anyone “acceptance” since we don’t see any mysterious falling off of interest in any end of life care and extraordinary measures for preserving life from theists. I do wonder what Rabbi Gellman’s former partner, a Catholic priest, would have said about petitionary prayers. Certainly he would not respond like the rabbi did, which is a bit of a shame. The rabbi says that the prayers should make the querent appreciate his mortality. He claims that such prayers have made the querent more compassionate. How, rabbi? How does making useless prayers make anyone more compassionate? The rabbi claims, again with not a shred of evidence, that these prayers are “spiritually enobling” by making the querent realize that he can’t do help everyone. I find this utterly disgusting, golly, prayers are to make you accept that you can’t help and must pretend that your prayers do something when they do not. Such a sad excuse the rabbi offers: “However, for your own good, you must realize and accept that what you want may not be granted just because you petition God.” Which of course goes against what the Old Testament says and New Testament says. Moses prays for this god to forgive Israel, and this god replies “I have, as you say.” (numbers 14) In the NT, “Anything that you ask in my name will be granted.” (John 14, 15 and 16). He gives a usual sop, the prayer that is attributed to a Confederate soldier, where this god screws over its petitioner repeatedly, but the believer makes excuses for its god. It is nothing more than the usual theist list of excuses of why its god cannot be found at all, that its god sometimes says no, that it decides to give something else other than what is asked, or it says wait, so the prayer can be claimed answered by coincidence. These excuses are of course contradicted by what the bible promises, that this god will never give something else other than what is asked for (Matthew 7, Luke 11), that prayers will be answered immediately (Matt 17, Mark 11). Indeed, where is the effectiveness of the elders of this religion where they will apply oil and the stricken person is healed (james 5)? Why doesn’t that work? Or is it simply challenging this god’s will if it doesn’t want the person healed? Indeed, in the OT, sickness is this god’s supposedly just punishment (see David’s son, cures for leprosy). But it’s all just silliness. Again, we see that religion is made and altered by humans, not by some magical being. what is prayer if not an attempt to seek god’s favour, that is, influence it? Indeed. it’s hilarious to watch theists try to claim that prayer is anything but what it was defined as in their holy books. But that’s what happens when prayer is shown to be useless and becomes a direct bit of evidence that their beliefs are false. “For MORE!” cried the legislators. “They did, sir,” replied Bumble. Number of cataracts removed via prayer alone: zero. Number of cataracts removed via surgery (prayer optional): millions. “God loves non believers more than believers, prove me wrong. ” What, why is the theist claim followed by “prove me wrong” any more valid? They really hate when you say that.